For his latest conceptual art project, Swiss photographer Roger Eberhard has travelled five continents and visited 32 cities where he booked the standard double room at the local Hilton hotel. He took a picture of the room’s interior, always using the same perspective, and of the vista from its window. Eberhard’s new book Standard, which has emerged from the project, offers a fresh and manifold view of a globalized world. The world’s largest chain of hotels maintains a remarkably uniform design for its rooms and their furnishing and decoration – truly a “standard”. Yet many of the rooms Eberhard has seen show a slight influence by local taste. His very particular urban panorama reveals how similar—perhaps exchangeable—the big cities around the globe have become in many aspects and at the same time have kept some of their characteristics. Three essays complement Eberhard’s photography in this book. In a new original text German novelist Benedict Wells reflects on the monotony he experiences on reading tours staying in successions of hotel rooms. Franziska Solte, scholar of art history, examines the hotel room as the modern interior par excellence. And photo expert Nadine Wietlisbach analyses and contextualizes Eberhard’s latest work. 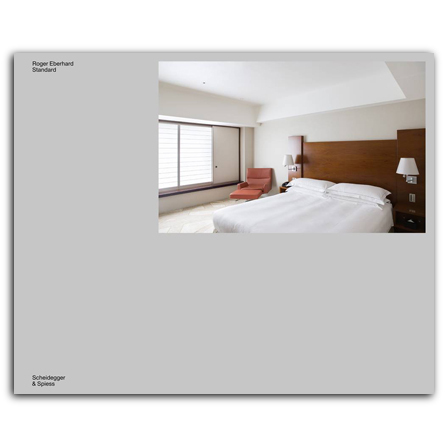 Roger Eberhard—Standard won a bronze medal in the 2018 German Photo Book Award. , born 1984, graduated from Brooks Institute of Photography In Santa Barbara, CA, and from Zurich University of the Arts ZHdK. He lives and works in Zurich and Berlin and runs his own publishing company b.frank books. is a scholar of art history and works as a reserach assistant at Humboldt-Universität zu Berlin. , born 1984, lives and works as a writer in Berlin. He is the author of widely acclaimed novels including Becks letzter Sommer, Spinner, and Vom Ende der Einsamkeit. is a curator and publicist and has been appointed as Director of PhotoforumPasquArt in Biel / Bienne, Switzerland, in 2015.